Zürich is the largest city in Switzerland and the capital of the canton of Zürich It is located in north-central Switzerland at the northwestern tip of Lake Zürich The municipality has approximately 390,000 inhabitants, and the Zürich metropolitan area 1.83 million. Zürich is a hub for railways, roads, and air traffic. Both Zürich Airport and railway station are the largest and busiest in the country. Permanently settled for around 2000 years, the history of Zürich goes back to its founding by the Romans, who, in 15 BC, called it Turicum. However, early settlements have been found dating back more than 6400 years ago. During the Middle Ages Zürich gained the independent and privileged status of imperial immediacy and, in 1519, was the place of origin and centre of the Protestant Reformation in German-speaking Switzerland, led by Ulrich Zwingli. Zürich is a leading global city and among the world's largest financial centres. The city is home to a large number of financial institutions and banking giants. Most of Switzerland's research and development centres are concentrated in Zürich and the low tax rates attract overseas companies to set up their headquarters there. 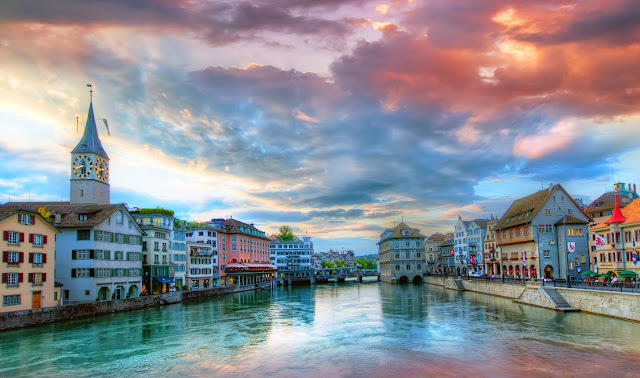 According to several surveys from 2006 to 2008, Zürich was named the city with the best quality of life in the world as well as the wealthiest city in Europe. Many museums and art galleries can be found in the city, including the Swiss National Museum and the Kunsthaus. Zürich also hosts one of the most important theatres in the German-speaking world. That's a beautiful photo. It's like a watercolor painting. Interesting stuff about Zurich. I wonder if the city has any homeless.